We frequently get asked for a high quality combination padlock from the more discerning customer that wanted to either resell the padlock to their customers or give away a great item that could be genuinely used for many years. 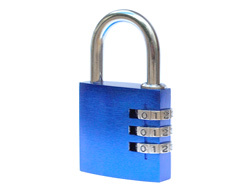 For this reason we developed this padlock. It is both strong, made from a solid piece of aluminium, but also light weight which makes it ideally as a promotional padlock if mailed. It is also a great lock for gym locks and luggage due to its low weight. We hold anywhere between 2000-5000 units at any one time in the UK and can usually turn around large quanitites within 2-3 weeks. It comes set to 0-0-0 but can be reset to you choice of code any number of times. Printing starts at a minimum of 251 units. The printing process on this lock is Tampo. That is the same highly durable finish you see on keyboards, your iPod, TV remotes and so forth. It is not impervious to scratching but it is very durable and gives the best finish of all the types of print we trialed. It also means you can print up to 4 colours in a single design. Note that the prices shown are for 1 colour. 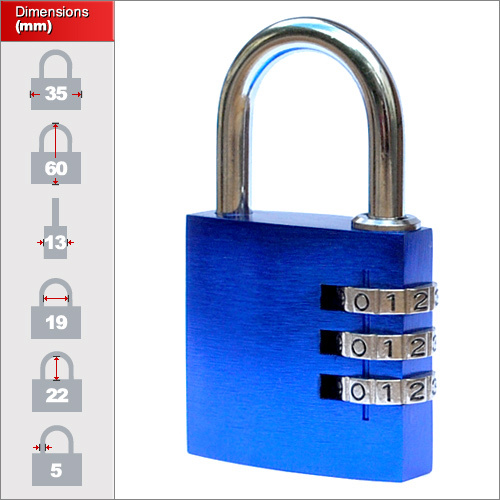 Add 35p per lock for each additional colour. As with any service timing can vary and depends on our printers. We generally say printing will take between 7-21 days after the artwork has been approved but usually we can have them all completed within 1 week.